Bathroom vandalism is a significant problem for many building owners and takes up a considerable amount of labor time for maintenance crews—time that could be better spent elsewhere. Aside from having a guard stationed in your bathrooms full time, there really is no way to eliminate destruction entirely. There are, however, more practical ways you can deter unwanted behavior. There is a creative “if you can’t beat them, join them” approach we’ve seen in restaurant bathrooms—chalkboard walls. More and more restaurant owners have turned to painting their bathroom walls with chalkboard paint, and then providing a supply of chalk in assorted colors. Once the walls are filled, your cleaning crew can simply erase everyone’s artistic expressions and allow new guests to begin the process all over again. There is a reason stainless steel fixtures are used in prisons and schools. They can stand up to just about any abuse that is thrown at them. Porcelain fixtures are a bad choice for public restrooms because it doesn’t take very much effort to break a porcelain toilet or sink. Once the porcelain fixture is broken you not only have a mess to clean up, but you end up with dangerous shards that can cause tremendous damage to a person. On top of that, you have to keep replacing the broken fixtures. Stainless steel fixtures on the other hand are practically indestructible. Is it overkill? We don’t think so. What if someone decided to use your sink as a chair while they chatted with their friends? Or someone decided to use your toilet as a step stool? This doesn’t even cover some of the things people do to in restrooms. These people are not your typical vandals, just people who made a bad choice. When you want something that will last for years and years in a heavy use situation, then stainless steel is the best choice. If you are less worried about vandalism and more worried about run of the mill damage in your restroom, then solid surface and resin countertops may be the way to go. Resin countertops are a popular choice for laboratories because of their resistance to stains, impact, scratches, and heat. That resistance makes them well suited for the high-traffic restroom environment. If needed, the surface can be refinished instead of replacing the entire unit. 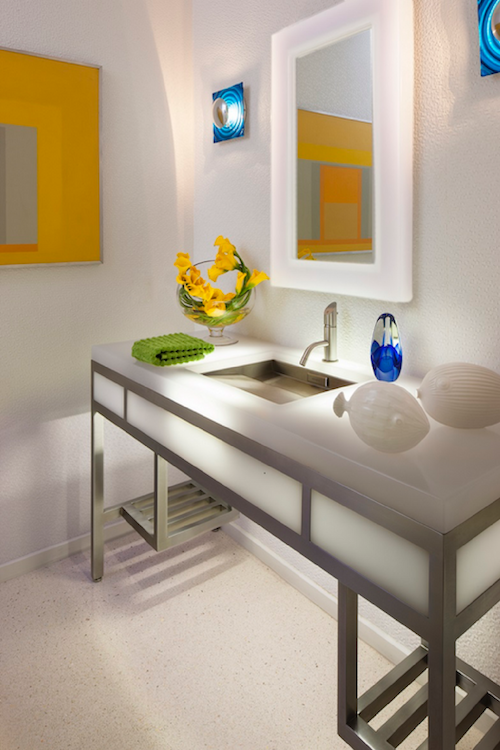 LED lighting has been incorporated into these resin countertops as both a lighting feature and a design element. Neo-Metro resin countertops can be made to match any pantone color or paint sample and can be cast into any size or shape in molds, allowing for highly customizable and unique pieces. Solid surfacing is resistant to chips, cracks, impact, scratches, heat, chemicals, and stains, and is Class A fire rated. It is durable and can easily be repaired or refinished. Cigarette burns, permanent marker, and minor scratches can be removed with a sander or a non-scratch scouring pad. 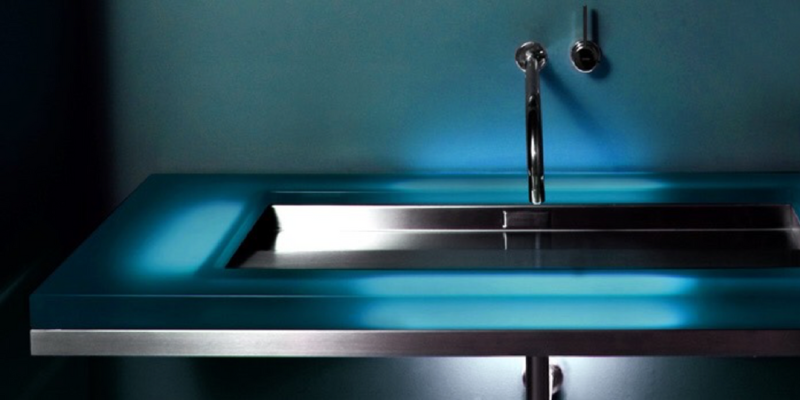 Shape, size, and thickness are customizable for unique designs and Neo-Metro solid surface sinks come in a variety of color options and can be custom color matched to suit any surrounding décor. 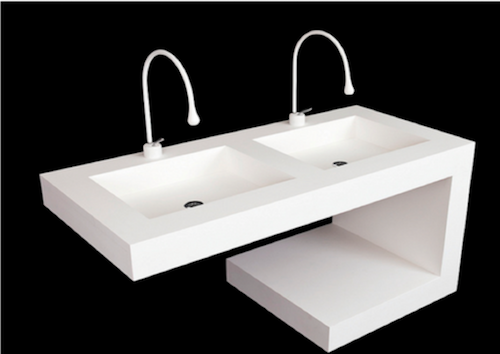 Custom 48” wall mounted Slab, double basin 17” X 14” X 4” with wall mounted shelf. This could be a single basin and installed in a hotel ADA room, the shelf could be a storage area for towels. 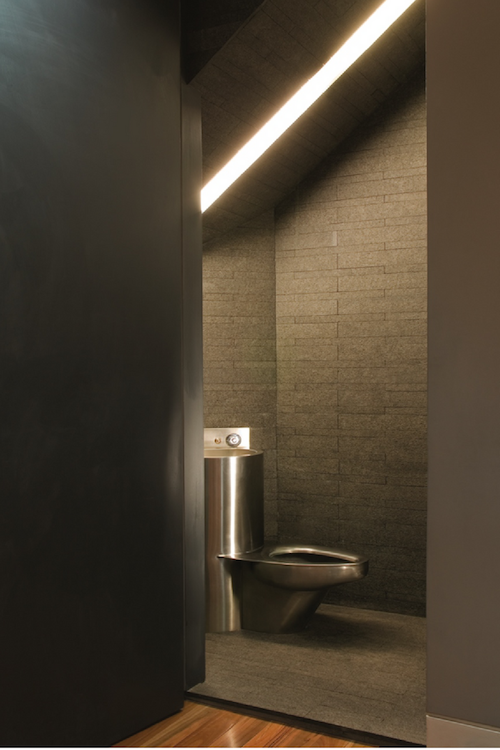 For more ways to make your restroom more appealing to the public and your employees, please read our tips on Hygienic Bathroom Design, Universal Bathroom Design, and Sustainable Restroom Design.